You Need to Clean Your Hair Brush, Too! Many of us spend a lot of time and money on hair tools, products and accessories. We all use our own methods for maintaining clean hair. Keeping our hair tools clean is just as important. Try out my quick and simple methods for cleaning hair tools. 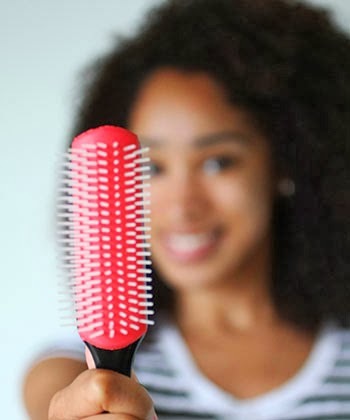 Remove the hairs trapped in your brush with a hair brush cleaner. There are many variations available. Select the one that would best fit between the bristles of the brush you are cleaning. This brush cleaner, below, works for most brushes. Once all the hair has been removed from the brush cleanse it with shampoo or a soap of choice. Remove as much water as you can with a towel then leave it to air dry completely before next use. Rub a bit of shampoo or a soap of choice on to the tool. If it has gunk on it just use a soft bristle scrub brush to clean it under running water. In a bowl, pour 1/3 cup of apple cider vinegar (acv) + 1 cup of clean water. Place your tool in the solution to soak for 10 minutes. Rinse it off with clean water and pat dry with a towel. Dampen a microfiber towel in the vinegar solution (1/3 cup of vinegar + 1 cup of water). Rub down the outside surface of flexi-rods with the towel. Then dry them off with another microfiber towel. *Do not soak the flexi rods. The liquid that gets on the inside may not dry and it could mold. No bueno. For the tools that are used regularly during the week it is good to clean them at least once a week. For others items that are used infrequently they can be cleaned immediately after use. That's all it takes! Give it a try!